I just replaced a broken screen on my iPhone 4, and now the phone says, "No Service." It detects the SIM card, and I was able to go to the home screen after inserting the SIM card and connecting to iTunes. But it still does not detect any service networks. It says, "Searching...." then goes to "No Service." There might be a few screws that aren't exactly the right size, and I've tried switching some of them to no avail. I am sure that the screw for the battery connector is correct. I am told the antenna is connected via screws. Is this correct? Any help would be appreciated. Thanks! The circuit board is faulty. That is the answer. The silver thingy that looks like its attached from the speaker isnt connected to the other part of the motherboard around the battery adapter, probably.. goodluck! I found the solution!!! I too replaced a digitizer on my iPhone 4 only to put it back together and find "no service". From the silver connector, trace the circuit towards what looks like a copper connector of the same type. In between the two male connectors, is a very very small resistor. It is either blue or purple in color (or is probably missing already). Bump it with a screwdriver and see if it moves. I spent 10 hours finding this out. I tapped the resistor, and it fell off. I joined the connection points together with a low temp solder and got full 3G service! dirtroadbuilder, you think you could post a pic of that.Would be great to see what it is that gives so many people so much trouble. IT HAS NOT CLICKED IN PROPERLY ! If the battery have been disconected the time and date is wrong and there will be a "searching issue". Tried it on my friends 4s and it worked! After tirelessly tearing the phone apart and reconnecting anything that may have been loose and cleaning all metal contact points, bridging the connection points of the missing blue resistor did the trick immediately ! It must get nicked off easily trying to reconnect this sometimes difficult antenna connector. I used a Craig Circuit Pen to drop a dot of the conductive liquid to bridge between the old resistor points, rebooted phone and had 3 + bars of 3G service ! There's about 4 ways I found you can solve this problem. Before a repair, take back off and follow steps up to and including the dock connector flex cable peeling back enough to see the "blue inductor coil" if present, continue repair. Make sure that logic board is seated 100% correctly and that the speaker assembly has all 4 metal clips under the metal bezel. Then make sure that the antenna cable is clicked on properly but be very gentle with it, try not to bed and push down lightly with spudger. 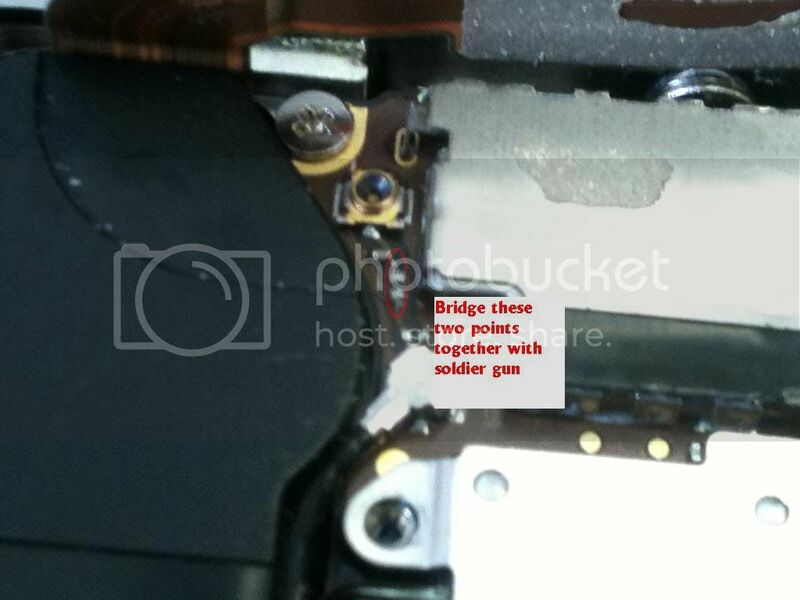 Make sure metal bracket is seated correctly under battery connector to ensure it makes contact with the back plate you put back on. I will put pictures up in approximately 9 hours. I tried to take photos with my work phone (samsung rugby) and Bluetooth them to my iPhone 4 but will not pair. The only reason I know this problem could happen is from iphone 3's I have done. What I can do is provide a link to that website to help get you in the right frame of mind. Also I do not know what the resistor is used for and why it works with the circuit bypassed, it just does. I have two 3g's with this bypassed and have been working just fine for a year now with no issues. It might might use more battery, but it's only been a day and I could just be paranoid. My next post will be the link if I can find it. i took my iphone 4 apart and put it back together like it is supposed to be. i made sure the connections were all connected but still no sim installed..this is very frustrating! any answers as to what i may have done wrong?? i am having the same problem. but i put the screwdriver in between the side of the phone and the mother board and got full service. its very touchy though and anytime it gets dropped or hit it says no service and i have to take the back plate off and re position the motherboard. did any of you guys have this problem and have you found a permanent solution for it?? I had the same problem,. I have an Iphone 4 running on IOS 4.1 & 2.10.04 Baseband, I could unlock using Gevey / Gevey Plus or Gevey Ultra, but I always showed up as NO SERVICE. BRIDGING THE TWO DOTS WHERE THE INDUCTOR SHOULD HAVE BEEN SOLVED THE PROBLEM. Now I have a unlocked phone and FULL SIGNAL BARS not even a single drop with 3G. Now I have upgraded the IOS to 5.1.1 preserving the baseband and I'm still able to unlock the phone, with an exception that the signal bar now only shows 1 bar, but I know that it's only a cosmetic issue, in real the bars are full. If you have an old Basebane like mine, and are on a newer IOS, the phone will show only 1 bar while it's on full. They say there is a way around this, by installing Ultrasn0w, but I've tried that, and while it solves the cosmetic problem for some, it did not solve mine. I'm happy with my unlocked Iphone 4. THANK YOU TO ALL THE TECHIES WHO CAME OUT WITH THIS SOLUTIONS. I snapped off the little blue inductor on accident as well. It doesn't need to be soddered to be fixed though. You can buy a circuit pen at radio shack for $20 and use that to bridge the gap where the inductor used to be, and service will be back to 100%! Very easy to fix! You can use a circuit writer pen to connect those to points. Circuit writer pen can be bought at Fry's Electronics or at Radioshack. Take your time by practicing on paper to get a perfect small dot. I just can't believe that it works ! I was going crazy about an iPhone 4 (not 4S) I'm sure that my work was perfect ! Everyone getting this issue should TRY THIS FIRST ! i have this problems.this is software. u mast connect to ituns .u mast connect by simcard.after connect to itunse u mast progres by itunse. after opening and closing more times than i care to renember, what worked for me was so simple. i used the wfi to reset the time, took out the sim and reinserted and hay presto i got a signal. this will work for you if the phone doesnt find the sim in the general settings. other wise its probably the antenna connection or finally solder the bit*h.
dont throw it out just yet. OK ive pretty much followed all your suggestions & i'm still getting the same issue. I have not replaced the screen or done any other work to the iPhone this is the issue it was brought to me for. I have replaced the speaker module with the antenna with 3 new replacement parts. I have also tried a different sim in there one sim gives me a 34g or gprs icon but still says no service. Any other suggestions at all guys? Same problem happened to me but I only reinsert(Unplug then plug it again) the antenna jack and then it was working normal as it need too!!! I suggest first try this if this have no luck then try other ideas which is replace the blue inductor. check your time and date,,That is the very first thing you have to do when there is no service!! I've had the same problem with the past three 4s phones I've "repaired", I haven't changed anything in my repair process and I'm seriously considering giving up. I've tried all the usual mentioned here, time and date are fine, blue coil is intact, silver clip is in the right place and so is the black pressure point, I have also tried a full teardown and back up and restore through iTunes. I am wanting to try cleaning the contact points but I'm unsure of where to clean and how. Will IPA solvent cleaner work and how do I administer it? Throwing in my experience here. I had the same problem, "No Service" all the time, intermittent periods of a 3G signal for maximum one minute before going back to "No Service". Now I'm back to having signal without having to go out an buy a soldering iron! Woohoo! i destroyed the touch you can see in the picture, please help me. If there is a way to make this phone work again and someone knows it i would appreciate to help. Mine is different my iphone 4 shows (searching or stuks on No Service) when i use cellular data or wifi connection . Does placing the silver connector can solve my problim? Quan Lin será eternamente grato(a).